Multiple pictures above, click for gallery. 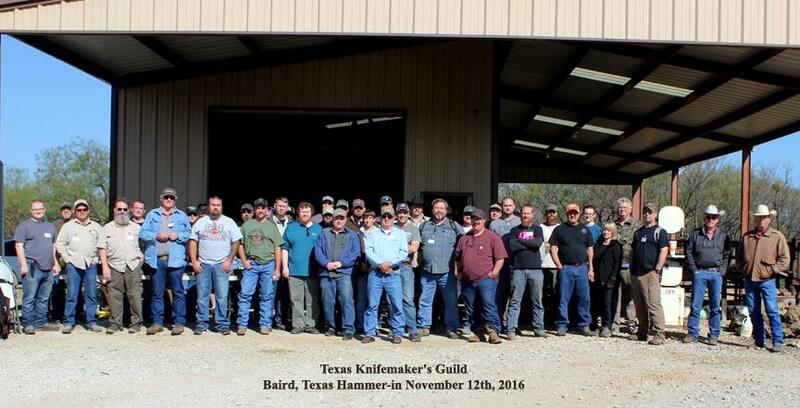 The TKG hosted a hammer-in at Chad Cunningham’s ranch south of Baird, TX on November 12, 2016. Last year it rained and folks got stuck in the mud, but this year we couldn’t have ordered better weather. Around 45 people came to the event, from as far away as Lubbock, San Antonio, and Bonham. Bob Ohlemann, former army ranger and national Knifemakers’ Guild member, spoke about marketing knives. He said that it was important to find your niche within the market, to find your own personal style, and to price your knives in line with what your level of experience, fit and finish, and the market will support. 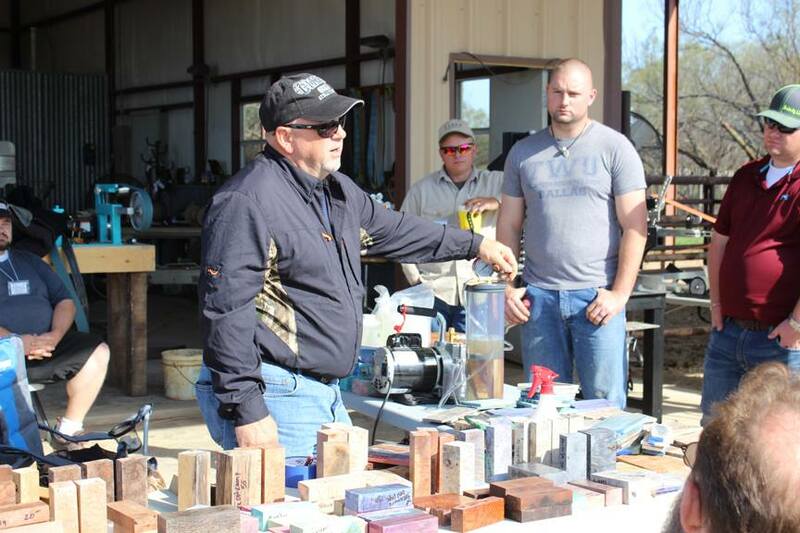 Matt Humphreys, bit and spur maker, waterjet guy, and grinder builder, spoke about the various grinders available on the market for knifemaking. 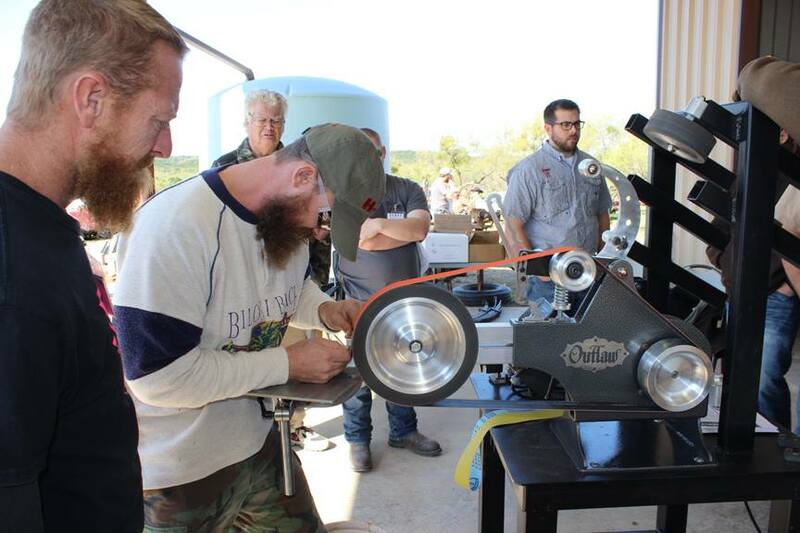 Matt is the designer and builder of the Outlaw Grinder. Terry Dunn, wood dealer and associate of Curtis Seebeck of Cactus Juice, spoke about the wood stabilizing process. He talked about the performance characteristics of the different resins and woods available on the market, and demonstrated how to use a vacuum and pressure chamber to stabilize wood. Terry also brought a wide variety of excellent wood for sale. Curtis donated a stabilizing chamber and quart of resin to the TKG for auction. 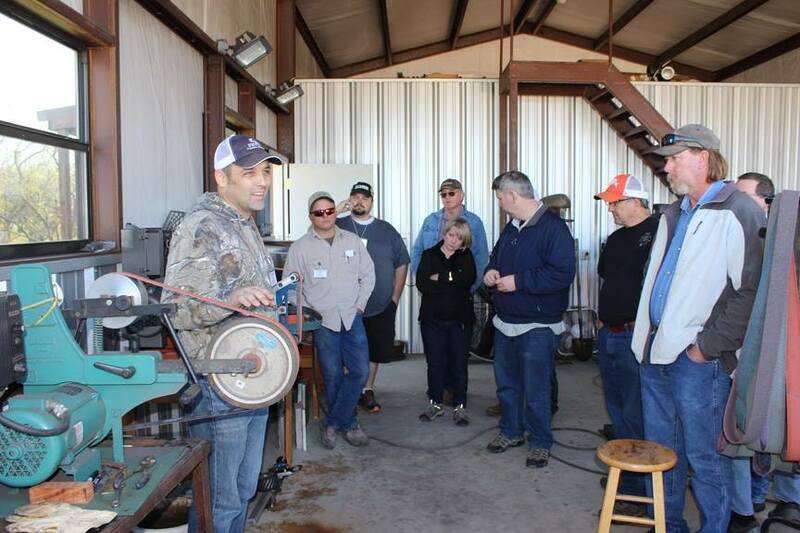 Our host Chad Cunningham demonstrated the welding and drawing out of a billet of Damascus steel. Layers of steel are welded together repeatedly and then manipulated to show a contrasting pattern. After the billet was drawn out to the appropriate sized bar, Jared Foster then forged it into a hidden tang hunter style knife. Jared took the knife home, and will finish it for donation to the TKG for a raffle at a later date. 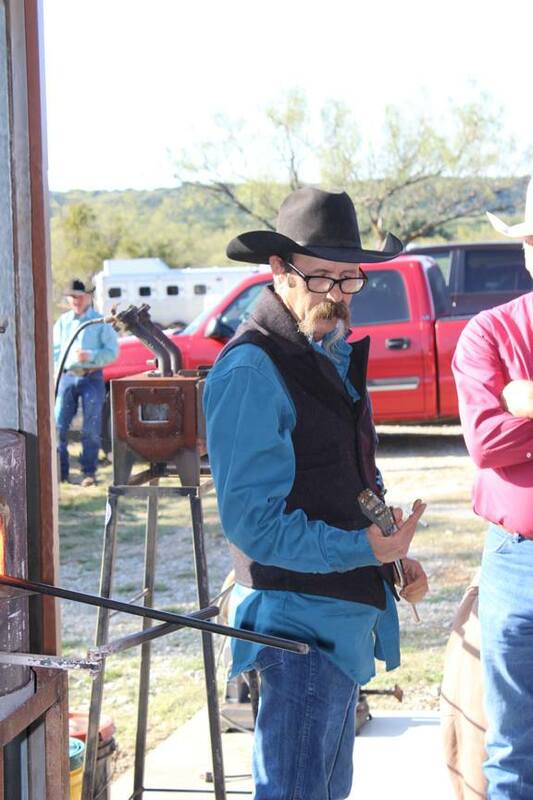 In addition to the formal classes, there was an ample amount of trading, buying, knife-talk, and fellowship. Everyone had a great time, and had great opportunities to learn.